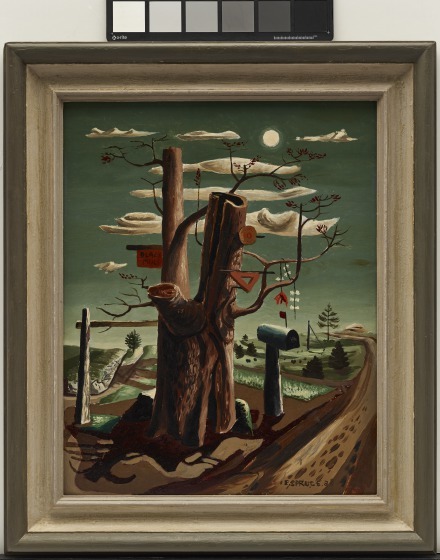 With its playful, almost cartoonlike description of the landscape, Night is an unusual example of Everett Spruce’s work in the 1930s, when he was a core member of the artists’ group known as the Dallas Nine. The name was taken from the title of the group’s first exhibition in 1932, Exhibition of Nine Artists Under the Age of Thirty. The Dallas Nine artists shared an interest in figurative painting, rejecting the vogue for abstraction then prevalent in New York as well as the impressionism of the previous generation of Texas painters. Spruce, a native of Arkansas, cultivated an expressive approach to the rugged southwest landscape, which he depicted with a geometric hard edge. In 1940, after working in Dallas for nearly fifteen years, Spruce joined the faculty of the University of Texas at Austin, where he taught for more than three decades. 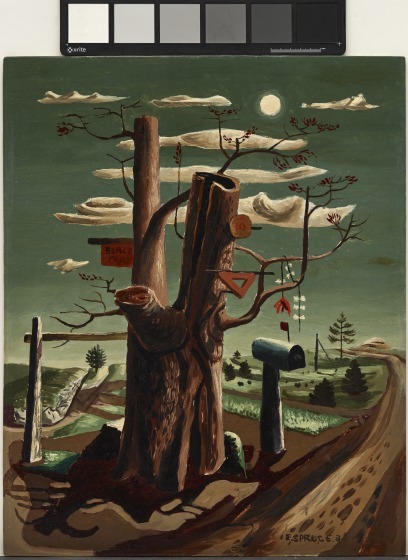 Here, Everett Spruce paints the end of a rural driveway with a mailbox awaiting a postman to retrieve its contents. 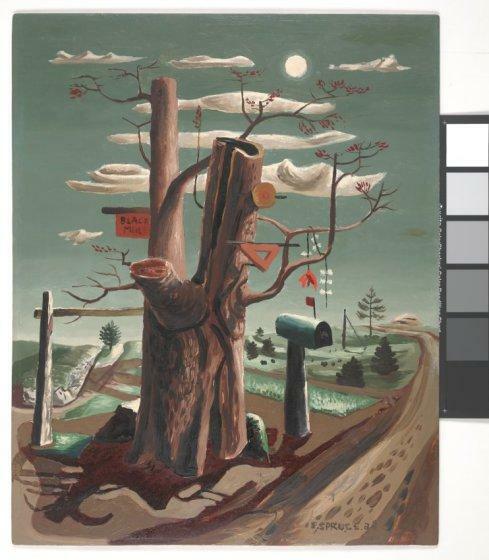 The mailbox’s flag, however, is just one of many visual cues in Spruce’s painting. 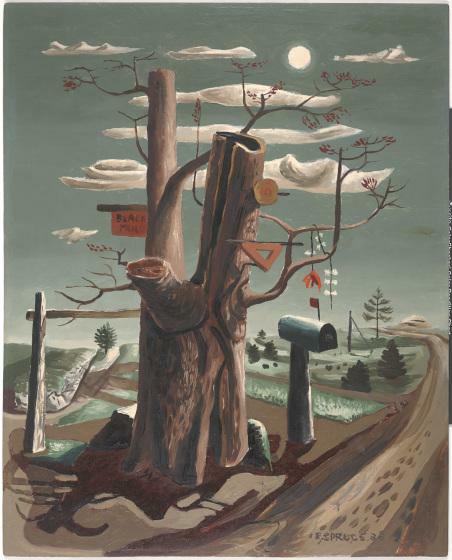 A severed tree trunk prominently displays its added features on hollowed limbs: a kite slung over a branch, a numerical pendant attached to the trunk, and, perhaps most notable, a hand-painted sign baring the name “Black Mule.” While the scene is devoid of human presence, these fixtures suggest the rotting tree lives through human utilization. Versions of this tree—dead, hollowed, and split—are present in many of Spruce’s surreal paintings from the 1930s, speaking to the artist’s affinity for organic subjects. Erin Pinon, Label text, 2016. 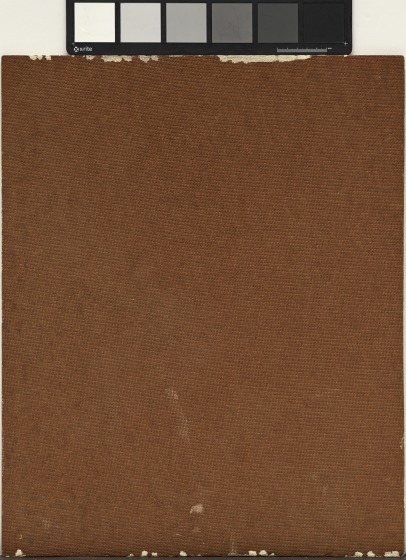 Bonnie Pitman, ed., Dallas Museum of Art: A Guide to the Collection (New Haven, CT: Yale University Press, 2012), 277. 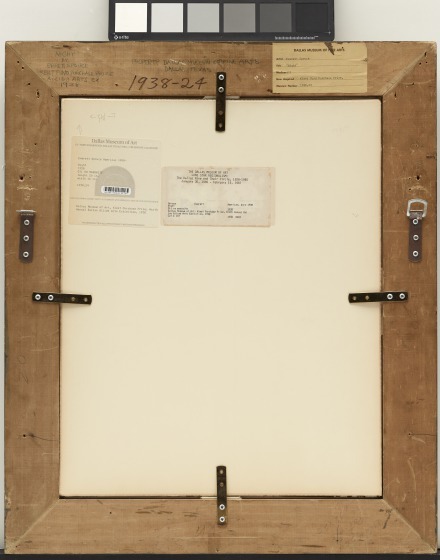 Learn more about the Kiest Memorial Prize on the DMA's Uncrated blog.